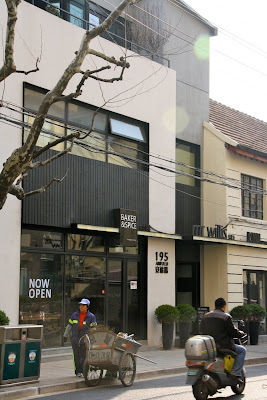 Great things are happening at 195 Anfu Lu in the French Concession. Downstairs is a fabulous bakery, Baker & Spice, who do a great line in sourdough, cornbread, pastries, coffee and cakes. Their little lumberjack cakes are the perfect thing with a flat white and a newspaper. Across the hall is La Strada, whose specialty is wood-fired pizzas. They're good, very thin and crispy, with great crust. But the real star here is Mr Willis, the upstairs restaurant. Craig Willis, the chef, is Australian and his expertise really shines in simple but well-executed dishes using spanking fresh produce. Today I ate succulent roast chicken with sweet roast pumpkin, a delicious clay-pot mushroom risotto, and a big, fat slab of pavlova. This classic Australian dessert was cooked perfectly (according to me), although every Australian likes theirs a little different (usually how their mum made it). Crisp meringue crust and soft marshmallowy centre, topped with fresh whipped cream, berries and passionfruit...fabulous! But if you're planning a lunch at Mr Willis, I suggest you don't ride your bicycle home through Shanghai peak-hour traffic with a basket full of Baker & Spice goodies balancing precariously on the front of the bike, and two glasses of very fine Australian white under your belt.